Lead has been used as a roofing and building material for centuries and this is for good reason. Lead is durable, adaptable and environmentally sustainable. Lead can also be considered a more cost effective option when compared to other man-made materials over a long term period. It has also been proven that with correct handling, lead sheet offers no harm to individuals or the environment. It is for the above reasons that there has been a resurgence in the use of lead over the last decade or so. In particular, many heritage and conservation architects have turned to lead as a way to both restore and protect our heritage buildings. Midland Lead Australia have supplied lead for a number of heritage restoration projects across New South Wales, Queensland, Victoria and South Australia. One prominent example was the restoration of Sydney’s Queen Victoria Building’s (QVB) façade. 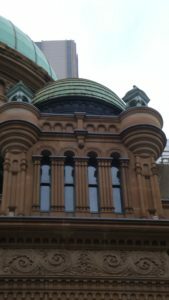 This project, which was completed over a number of years, involved installing lead sheet along the QVB which faces York and George Streets in the CBD. Another example was the application of lead sheet to the Turret of historical Kogarah Post Office in Sydney’s South. 30kg lead was installed in traditional batten roll design to original detail with scalloped laps and bossing. Midland Lead Australia also supplies a wide range of ancillary products to complete your project. Please refer to the Ancillary Products section of the site for further information and a full list of products available. Midland Lead Australia are proud to be a leading supplier of quality lead products that contribute to the restoration of prominent heritage buildings to their former glory. Midland Lead Australia has gained much experience and knowledge from our relationship with heritage experts in the field. Please contact us today to discuss your heritage project and to see how we can assist. Midland Lead have been manufacturing lead for 27 years. We are proud of the high-quality lead products, lead flashing and service we have been giving to our customers since 1983. Contact us to discuss your requirements. Call 1300 696 313 or click here.